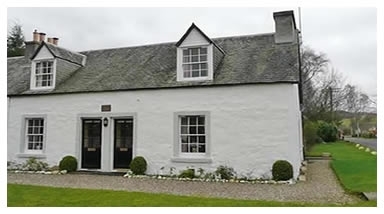 Comrie Cottage consists of two semi-detached units thought to have been built in 1816. One of these units which is totally self-contained is available to let as self-catering holiday accommodation, the other being occasionally occupied by the joint owners of both. Downstairs - Lounge/diner with TV, DVD Player, CD radio cassette, electric fire (with open fire option), dining table and chairs and comfortable sofa and armchair. Kitchen - which is completely modernised with 'fitted' units, electric hob cooker, integrated fridge and washing machine. Bathroom - with bath, shower and electric shaving point. Upstairs - A large bedroom with one double and one single bed and ample wardrobes and chest of drawers. Bed linen and towels can be provided if required (at extra cost). The cottage fronts on to an area of open grassland, like a 'village green', where cars can be parked. There is a 'private' garden at the rear with garden table and chairs. The centre of Comrie village is a 10 minute walk. Comrie has 3 hotels, 3 cafe/restaurants and various local shops and won Britain in Bloom (village Class) in 2007.